With the crazy amount of games that get released on a yearly basis, it is easy to lose sight of some smaller indie gems with the fanfare surrounding larger titles. I, however, was thankful that Monochroma did not escape me. 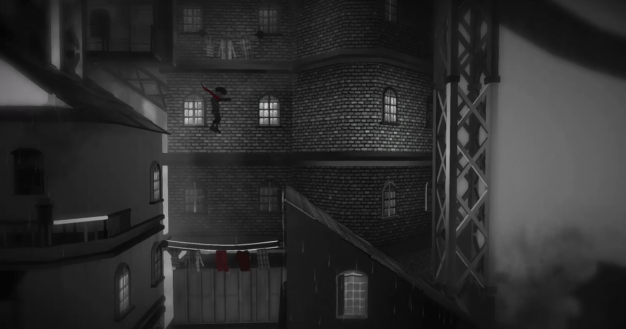 New to consoles, but not to PC gamers, Monochroma is a side-scrolling puzzle game set in a 1950s dystopian past timeline. You take control of a young boy who must think his way through this world to help save his little brother. Now, let’s dispel any preconceived notions you may have about this game based solely on its genre. This is not your typical side-scrolling puzzle game. There is no super fancy, yet useless powers, no convoluted mechanics, just a good solid game. So, with that in mind, let’s get down and dirty in dystopia. 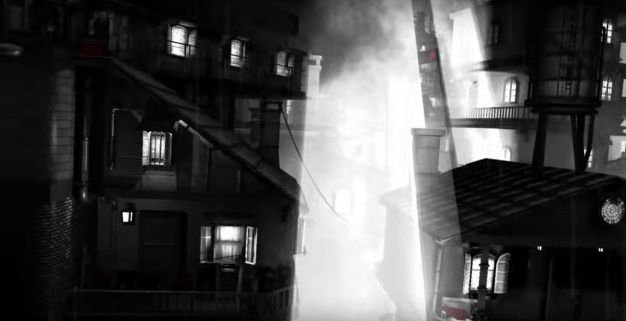 Right off the bat, Monochroma hits a home run by creating a black and white world. For me, nothing helps add a touch of nostalgia and despair like a good black and white environment. What sets Monochroma apart, however, is its distinct use of the color red. 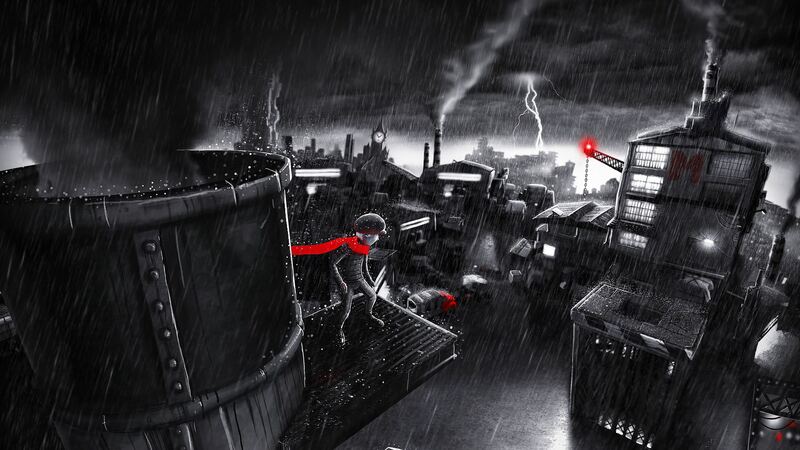 The protagonist for this game dons a flowing red scarf, and his younger brother sports a pair of red aviator goggles. As you progress through the game, you will see other instances of color that not only help to add a striking look to the game, but highlight importance in the game’s plot. The gameworld is dark and rainy; again this helps to deepen the sorrow that has infected the land. Visually speaking, Monochroma sets up a land devoid of hope and full of despair. Pain seeps out of every crevice, a visual clue to the emotional state of the people in this world. Secondly, all the of the audio work in Monochroma is award-worthy. The soundtrack combines a unique blend of both classical strings and jazz to highlight different moments in the game. The combination of a dramatic orchestra set against the dismal weather is hauntingly beautiful. At one moment, I stopped and admired the emotion in one scene as I stood in a rainy ghetto drowning in somber violins. Aside from the actual soundtrack, the ambient sounds within Monochroma are phenomenal as well. I confess one of my favorite moments from playing was when I crawled up on top of a clay rough and heard the gentle rattling of clay shingles. From rain on the ground to the sound trains going by, Monochroma immerses the player in a ultra-realistic world. The commitment to this world is nothing short of fantastic. Monochroma‘s plot is both quite apparent and highly nuanced. The reason for the nuance is that the game contains absolutely no dialogue; all the information you get about the game, your character, the world around you and its troubles is conveyed visually. The game opens up with you watching a small child (your brother) chase after his kite. You run after him to make sure he doesn’t hurt himself, but sadly you both fall through a roof, which injures your brother. You pick him up and start off for home. However, as you are walking back, you stumble upon a warehouse filled with frozen human beings. As you explore the warehouse, a brutish man begins to chase you. The rest, I will not spoil. What I can say is that the plot is quite in-depth and heartfelt. By the end of the game, I developed a great attachment to the protagonist and his little brother. Seeing the protagonist undergo so much – all in the name of saving his little brother and getting him home safe – makes you want to continue playing. Monochroma‘s plot is one of those rare blends where the story conveys an important moral lesson without being preachy or too didactic. I would play this game for the plot alone; combine this with the award-worthy soundtrack and you have the makings of one fantastic game. Just like the rest of the game, Monochroma relies on simplicity instead of complex mechanics. You use the directional pad to move left and right, the A button to jump, and walking up to an object and pressing B will allow you to pull it. To pick up and put down your brother (which can only be done in illuminated areas) you press Y. Finally, while your brother is in That’s it ladies and gentlemen: simple controls, challenging puzzles, fun game. A lot of the challenges are based on perfect timing forethought, and your mind’s ability to see past the immediate to solve the problem. As an avid puzzle gamer, I was impressed that some of the puzzles were able to stump me for a span of twenty minutes. Now, no game is perfect; there is always room for improvement in some areas. Monochroma relies on simplicity, which I admire, but is does have an issue with the core mechanics. The protagonist does not jump consistently. When he jumps off a ledge he stops dead for a second and won’t grab onto certain things. These bugs sometimes make the game funnier. However, when an individual puzzle relies on impeccable timing, and you have died for the fifth time because for some reason you can’t make a jump, it begins to get annoying. Despite this being – in my opinion – a significant problem, the game does still have sound mechanics when they function as they are supposed to. In summation, Monochroma is a fantastic videogame and is 100% worth your time and money. As far as just visuals and sound, it would be worth it to play the game just to experience those aspects. 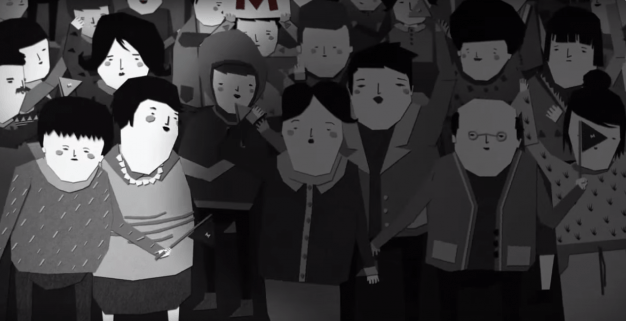 If you want to play a game that can move on a deep sentimental level, look no further than Monochroma.